Flying from Jacobabad to Karachi many years ago, I had spotted a rather puzzling wall-like structure which seemed to snake over and around the stark Lakhi Hills, which form the south-eastern frontier of the Kirthar Range. Confounded by the unusual feature which is not shown on most ordinary maps, I later learnt that it was known by the name of Rannikot. Unfortunately, whatever remains of Rannikot’s history has been thoroughly warped by fiction, the tallest tale being that it is the world’s largest fort. Other than the Talpurs’ historical records making mention of the construction as their handiwork, no earlier account is available to contest it. The annals of Rannikot thus seem to end up in knots. With a weekend to spare in Karachi a few weeks back, I got a chance to untangle whatever little I could about the enduring inscrutability of Rannikot. It didn’t take much to convince my friend Nauman Farrukh that he needed a break from the humdrum never-ending work. We set course at eight in the morning and took the Super Highway which is in first class condition all the way north to Sehwan. Reaching the small town of Sann after a three-hour drive, we turned south-west on to a narrow road, leaving the green flood plain of the Indus behind us. The utterly desolate terrain occasionally cheered up the odd lark chirruping in the scrub. As we travelled ahead, barren hills started to loom in front of us and it was easy to see what a formidable barrier they could be, especially in the scorching summer heat. Small groups of shanty reed huts could be seen not too far from the road. Other than an odd village scrounger begging by the roadside, there was hardly a soul in sight. After a drive of about 25 kilometres, we sighted the wall undulating over the hills; shortly thereafter, we came upon the bastions of the eastern entrance known as the Sann Gate. The wall, viewed from this point, resembles some portions of the Great Wall of China, though any attempt at reading too much into this commonplace description would be utterly superfluous, as we shall see. A milestone by the roadside near the gateway marks Rannikot, while the small Miri Fort lies a further five kilometres ahead. It would be worthwhile to clarify that Rannikot is not a fort as is usually understood. 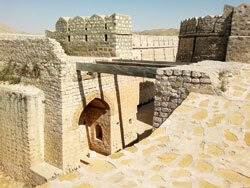 It simply denotes the outer fortification wall that has numerous circular bastions serving as watchtowers. The wall is not a continuous structure and is, in fact, constructed in several segments ranging from one as small as 39 metres to the longest one which is 3.8km, all adding up to 8.2km in length. The wall largely plugs gaps in the hills where the terrain is passable by intruders, mostly towards the south. The wall cleverly aligns with the crests of the hills and forms a continuous barrier, which is, in most part, natural and much less manmade. Put together, this barrier has been incorrectly termed as a single wall with a length claimed to be anywhere from 26-36 km. Unfortunately, UNESCO’s World Heritage Site Listing, which gives it a tentative status, gullibly takes up the Pakistani claim. The three-metre-wide wall is clearly visible (as well as measurable) in Google® Earth satellite pictures. There is no doubt that overly keen enthusiasts have blatantly distorted facts about its length. Passing through the bastions of the gateway, we crossed the dry ranni (a local word for hill torrent) which meanders across the Rannikot fortification. In the rainy season, the stream starts as a torrent in the northern reaches of Lakhi Hills and after swinging east, discharges in the Indus near Sann. We had to make a short detour over the rough and stony terrain, as a bridge is being constructed over the stream which is known to swell enormously during flash floods. By the wayside, we spotted a small shack which doubled up as a makeshift petrol pump and a tea stall for odd travellers like us. The friendly owner, Ali Sher Rustamani, assigned a 10-year-old by the name of Bilawal to guide us. He was said to be well-versed with the area. After a short drive, we had to ford the gushing stream twice as that portion is abundantly fed by a natural spring. Luckily, the car’s silencer stayed clear of the water bed, though it’s rattling gave us a brief scare — what with no mobile phone coverage to call for help. Authorities seem to be paying some attention to the prospects of tourism as indicated by another bridge which is under construction over this section. As we drove on towards Miri Fort, our little guide Bilawal told us that he knew all the hills and vales because he herded his father’s cattle and goats in the fort’s environs. A happy young lad, Bilawal’s only dread was the charakh (striped hyena), a pack of which had recently devoured his favourite calf. Reaching the fort, we entered through a looping vestibule into a large bell-shaped courtyard, a little less in size than a football field. Two dozen dilapidated cubicles and halls made up what might have been the armoury and other accommodation of the garrison personnel, who once manned this outpost. Four corner bastions and one at the entrance, served as watchtowers as well as platforms for artillery pieces. Other than a floral stone carving on the entrance arch, the fort is absolutely utilitarian and there is no evidence of any imperial splendour. Crude renovation attempts on the structure are amply evident. Climbing up a stairway to the top of the fort’s thick walls, we got an excellent view of the surroundings. A lush green patch abutting the stream marked a Gabol village, which seems to have done well in small-time farming. Looking north, we could see the outline of another small fort about 1.5 km away, on the crest of a hill range further beyond. It seemed like a perfect retreat, though reaching it would be a tough call for all but the stoutest of men. 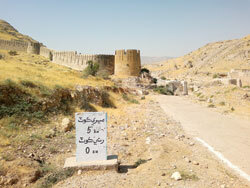 Shergarh (or Shergah) Fort had been aptly named, I thought. Several sources attribute the construction of Rannikot to the Talpurs of Sindh (ruled 1783-1843). The earliest is a composition by the Talpur court poet, Ghulam Ali Ma’il, in which he eulogises the achievement of his patron, Mir Karam Ali Khan Talpur. He states that work started in 1815 and was completed five years later. The extant family records of the wazir and project overseer, Nawab Wali Mohammad Khan Laghari, also attribute the planning and construction of the fort to the Talpurs. In his historical Sindhi narrative, ‘Fatehnamo’ (1907), Mir Hasan Ali Khan records some details, including the cost of the fort’s construction viz, Rs17 hundred thousand, that was borne by the Talpur treasury. From earliest antiquity till the start of the 19th century, there is no mention of Rannikot in any writing, whatsoever. One of Emperor Akbar’s historians, Mir Masum, who accompanied the Mughal military commander Khan-i-Khanan during the conquest of Sindh in 1590-91, does not record any fort in the area, despite the invading army having tarried at nearby Sann for several months during the monsoon season. Similarly, Rannikot finds no mention in the historical records of the Kalhora rulers of Sindh who held power for over eight decades before the Talpurs. Talpurs were known to have built as many as 20 forts and strongholds on the frontiers of Sindh, ranging from the coast to the desert. Rannikot was one of their special mountain redoubts, and for good reason. Not having forgotten the fate of one of the Kalhora predecessors, Mian Noor Muhammad Kalhoro, who was humiliatingly vanquished by the Persian Nadir Shah at the defenceless fort of Umarkot, the Talpurs took heed and started preparing for such an eventuality. The Talpur family hunting grounds at present-day Rannikot, which still abound with the graceful Sindh Ibex(Capra aegagrus blythi), were chosen as the ultimate hide-out for a fight back, just in case. Sixty years of Talpur rule in Sindh ended in 1843, after British guile and General Charles Napier’s “rascality” — to quote his own words — resulted in a rout at Doaba (Dubbo) near Hyderabad. The last ruling Talpur Mirs of Hyderabad and Khairpur were deposed and packed off to Calcutta, without either one getting a chance to repair to Rannikot. The brave ruler of Mirpurkhas, Mir Sher Mohammad Talpur resisted, but his forces were defeated by the relentless John Jacob of Jacobabad fame. Sher managed to escape but had to wander as a fugitive for over a decade. 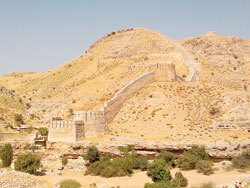 He did find refuge in Shergarh Fort for a short while but had to move on for fear of being pursued. Eventually, he had to make peace with the British as their wretched pensioner.